For some reason (that reason most likely being brain damage) actor Gary Busey is under the impression that Hobbits are real. So much so that on his YouTube series “The Busey Zone” he shows off his severed Hobbit foot and sings a song about how they’re really horny. Jump to 3:28 for that nonsense. Because in Gary Busey land, “Horny starts with an H. The letter H. Hobbits start with the letter H. Horny Hobbits are thriving in Middle-earth. They don’t know what a reindeer is, but they’re horny like you can’t believe it.” This guy’s brain is like a bag full of cats. Neil Gaiman’s newest book The Ocean at the End of the Lane isn’t set for release until June 18th, but Joe Wright (director of Atonement, Pride and Prejudice, and Anna Karenina) is all set to direct a film version regardless. Preferably without Keira Knightley, but with the same haunting cinematography and costume design. Gaiman’s novel is touted as being about “memory and magic and survival, about the power of stories and the darkness inside each of us”. In which the narrator witnesses a suicide at seven and “unleashes ancient powers” and must seek help from three woman, the youngest of who thinks her duckpond is the ocean and the oldest who remembers the Big Bang. Dying of amazing! We’ve been hearing about a P&P&Z movie for a while now and had pretty much given up all hope, but apparently Paranorma Media, Darko Entertainment and Handsomecharlie Films have stepped in to revive the project. Possibly thanks to the success of Warm Bodies, but don’t quote us on that. The film still doesn’t have a director, so this is no calls for super excitement levels just yet, but there are plans to premiere it at Cannes. Now if only they would just hire everyone from the BBC miniseries and re-film it with zombies. Wet Collin Firth as Mr. Darcy and all. Q: How many “Game of Thrones” trailers are too many trailers. A: There will never be too many. Hot on the heels of the official third season trailer comes the official third season extended trailer. In it we get to see more Tyrion, the shadow of Reek, and even a horrifying glimpse of that bear scene. In even more exciting “GOT” news, actor Charles Dance (Tywin Lannister) accidentally let loose that he already has several scripts for season four episodes. So at least they’ll finish A Storm of Swords before they’re forced to deal with the Feast for Crows mess. One of our favorite things is when actors from “Buffy” show up on our television screens. And not just when Chiller is airing re-runs. So we were super happy to hear that Anthony Stewart Head (AKA Giles) was cast as King Clarkson for the new YA book based television series, The Selection– previously discussed here. This will mark ASH’s second time as a television king. 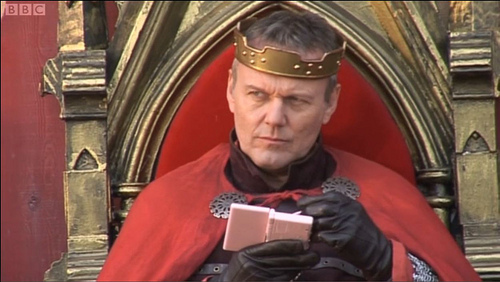 You may remember-or not, I don’t know what you do with your time- Head as Uther Pendragon on the bromantic BBC show “Merlin”. Well imagine him, but nicer and with less freaking out about magic slash less inviting every person who wants to kill him into his home slash less troll foreplay. We assume. We haven’t read The Elite yet. We don’t mind at all when Joss Whedon uses the same actors over and over again, since he has so much prime talent to work with and he seems to cycle through who he uses. We do mind that Tim Burton keeps casting Johnny Depp and Helena Bonham Carter as his leads. You don’t see Joss Whedon making Nathan Fillion the male lead in everything so… Wait a minute, new idea. Make Nathan Fillion the make lead in everything. Check out the trailer above for Joss’ modern reinterpretation of Shakespeare’s Much Ado About Nothing starring all these people. Hey everybody! Look! 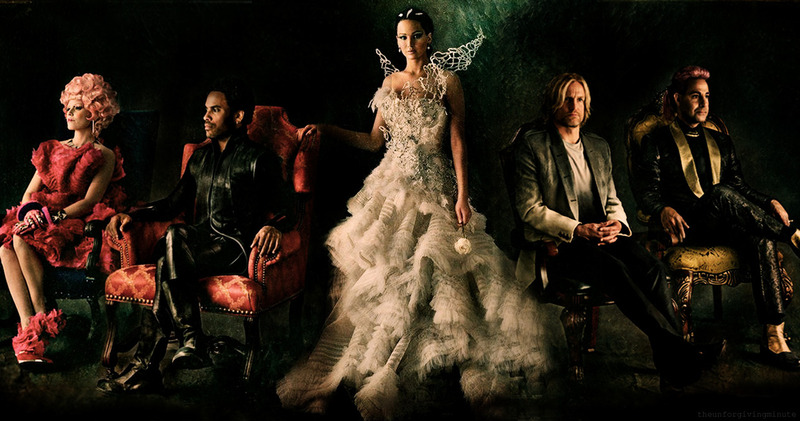 It’s some promo photos (see them all: here) from Catching Fire with the cast in fancy chairs! Yeah, we really don’t understand it either, but that doesn’t make it any less exciting. To further tease the upcoming movie, the production team slowly released Capitol Portraits of the cast, including brand new characters Johanna Mason, Beetee (who is to our chagrin not Tony Shaloub) and Finnick Odair. Sadly absent is Plutarch Heavensbee. With the DVD release of Breaking Dawn, so too comes an end to a wonderful era. An era of Twi-hate. To celebrate perhaps the last time we can hate on Twilight together, please enjoy the Honest Trailer version of the last two movies, complete with that epic fake out I mentioned in my original review. Featuring: the worst pro-life message ever, an awful new baby name for teen moms and Bella screaming about the Loch Ness Monster (jump to 1:42 for that). Seriously, the video is worth it for Kristen Stewart’s vampire “acting” alone.